The Purple Tipped Acropora is one of the more affordable Acros, yet its beauty is priceless! The Purple Tipped Acropora Acropora tenuis, also known as the Table Top Coral or Tabulate Coral, is usually cream colored with purple tips. They can also be blue, purple, cream or brown with blue or cream tips, dark red or other bright colors. All the variations in hybrid colors are too numerous to count! The corallites at the tips have a rosette pattern when viewed from above. The Purple Tipped Acropora is easily recognized, though they do show variations based upon their geographic location. Specimens found in the western Indian Ocean and the Red Sea have relatively thin and rounded corallite walls. They are easy to frag, and once established they grow fast, so a very large aquarium is suggested. The A. tenuis have been propagated in captivity thus helping to spare wild populations in the world's reefs. Buying captive propagated A. tenuis helps the aquarist, since they are a little more hardy than their wild siblings, but they can still succumb to diseases typical to Acros. 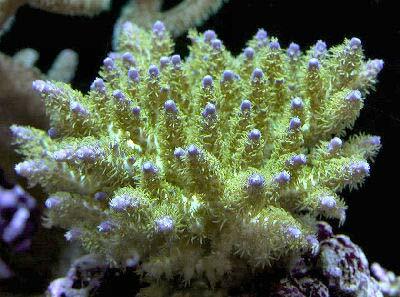 Acropora Coral Information: The Purple Tipped Acropora Acropora tenuis was described by Dana in 1846. They are in what is called the selago group of Acros that include A. selago, A. donei, A dendrum, and A. yongei. Their corallites have flared or pointed lower lips. Some of their growth forms have been included in common names such as Table Top Coral, Tabulate Acropora, Purple Tipped Acropora, and Plate Coral. They show variations based upon their geographic location. Specimens found in the western Indian Ocean and the Red Sea have relatively thin and rounded corallite walls. Where Acropora Corals Are Found: The Acropora tenuis are found in the Pacific and Indian Oceans and the Red Sea. They are found from Mauritius, east to the Marshall Islands, Coral Sea and the Elizabeth and Middleton Reefs in the east, and Australia's Great Barrier Reef as well as the Houtman Abrolhos Islands on Australia's west coast. Acropora Coral Habitat: The A. tenuis are found on upper reef slopes where the current is very strong. In the wild, Acropora spp. corals are found across the reef in various locations from turbid waters (with sediment or foreign particles stirred up or suspended in the water) to those with strong waves and high currents; from areas where there is little light to being fully exposed to the sun (and the air) at low tide. What do Acropora Corals look like: All Acropora Spp. corals have very porous and lightweight skeletons. The Purple Tipped Acropora A. tenuis has evenly spaced branches and radial corallites that are long and tubular. These look like sideways "C"s connected to the branch. Their corallites have flared or pointed lower lips, giving them a rosette pattern when viewed from above. They come in cream, blue, purple, or cream with purple tips and other bright colors. These corals are characterized by fast growing terminal (or axial) polyps at the tips of the branches. The polyps at the tips secrete this corallite, constantly forming new growth in a cluster shape. These terminal polyps do not have zooxanthellae. They grow quickly because the terminal polyps are fed by the rest of the colony. This allows Acropora to outgrow other corals on the reef. Their radial corallites (the cup formed by a polyp) are found in two sizes. The larger ones are in rows and increase slightly in size towards the base of the branches. The appearance is a neat cluster look with a "ball" like shape arrangement. This growth is necessary since the A. tenuis is found in very turbid water. At times, this coral is exposed to the air at low tide. Acropora Coral Life Cycles: The Purple Tipped Acropora A. tenuis reaches sexual maturity within 3 to 5 years, with a branch diameter of 1.5-2.75" (4-7 cm). They can live 4 to 7 years. Acropora need to be carefully acclimated to their new homes. They need to be placed in their permanent position within a tank after acclimation. It takes about 5 to 6 months for the A. tenuis to regain their normal growth rates after being added to an aquarium. Moving Acropora from place to place will stress them, and possibly cause death. A typical live rock/reef environment is what is needed for your Purple Tipped Acropora, along with some fish for organic matter production. A mature tank (well over a year old) is advised to increase the chance of successfully keeping Acropora. Marine Lighting: High, metal halides are suggested. Water Movement: Moderate to strong. They prefer a strong, random, mixing-type current, therefore a rotating powerhead or wavemaker setup is recommended. Acroporas grow rapidly and are considered to be among the most rapid growing of the stony corals. They will reach sexual maturity within 3 to 5 years, with a branch diameter of 1.5 - 2.75" (4 - 7 cm). They fragment easily and the fragments can form new colonies. This makes them ideal candidates for captive breeding/propagation. Acropora Corals for Sale: The Purple Tipped Acropora A. tenuis can be found easily online and at pet stores, as well as from frag farmers and most reef clubs. Online they can run about $30.00 USD or more depending on size and color.